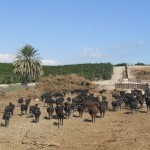 This dairy goat farm is located in the south-east of Spain (Almeria) in a peculiar and strategic situation, as it is surrounded by a massive plantation of orange and lemon trees (700 ha). Fruits that are not appropriate for the human consumption market and branches+ leaves from cleaning and pruning are provided free of charge to the farmer daily who offers them directly to the animals. On the other hand, the manure produced in the dairy farm is provided to the citric company as organic fertilizer. Due to the particular weather conditions in this region of Spain (10-30ºC) housing facilities are not needed throughout the year. The farm is run by a family (2 members) and one long term worker. 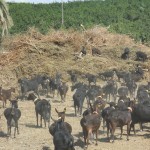 They don´t have bank loans and use a low-input approach in terms of investments, financials, feeding, fertilizers, etc. Goats’ milk is sold through a cooperative for cheese making. 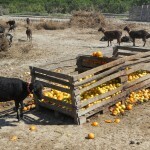 Feeding is based on oranges and leaves according to the season, from January to June, leaves are fresh-green and from June to December leaves are sun dried. Concentrate feeds are offered during milking curve according to animals´ requirements and the supply of nutrients from orange derived products. We are conducting an ‘on-farm’ trial in this farm as part of WPs 1 and 3 activities to study in depth the feeding management in terms of maximizing the use of by-products and the impact of such strategy on milk production and quality. Public access is not encouraged, but the farmer is open to appointed visits. Biodiversity and nature conservation: No conservation plan. 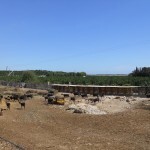 The farm is ‘literally’ surrounded by orange and lemon trees plots (see photos).